School integration has vexed policymakers for more than half a century. The Supreme Court ruled in 1954 that schools can't keep kids out based on race. Then in 2007 it ruled that schools can't bring kids together based on race. After the court struck down two race-based integration schemes in Seattle and Louisville, Ky., attention turned to diversifying schools via students' household-income levels. Economic integration, a concept first floated by early public-school crusaders like Horace Mann, is a compelling idea with intuitive appeal: reduce the preponderance of high-poverty schools by spreading poor students around. The idea jumped back into the spotlight this month when the Century Foundation released a new study touting the benefits of economically integrated schools. The glaring problem from a policy perspective, however, is that low-income families tend to live in the same neighborhoods, and dramatically changing housing patterns  or school-zoning boundaries  as a large-scale reform measure is impractical. The study looked at about 850 low-income students whose families took advantage of housing programs that enabled them to live in affluent parts of Maryland's Montgomery County. Over the course of seven years, the high-poverty students attending low-poverty schools had better outcomes than their peers who attended schools that had greater numbers of poor students. In particular, the achievement gap at the elementary level was cut in half for math and by a third in reading. These findings aren't terribly surprising. It's well documented that, in general, as the level of poverty increases in a school, academic achievement suffers. Low-income students are more challenging to educate, and schools serving them often have fewer enrichment activities, highly effective teachers and other key educational resources  even in places like Montgomery County, which has been sharply focused on addressing the achievement gap over the past decade. Although the outcomes in the new study are encouraging, there is a disconnect between the enthusiasm for economic integration as a concept and the reality of implementing it on a large scale. 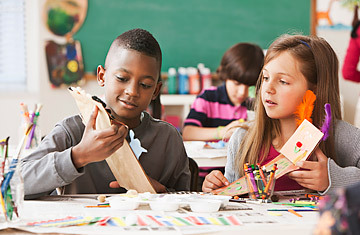 For instance, when Jerry Weast, the superintendent of Montgomery County Public Schools, noted the logistical challenges of economically integrating a lot of schools, he was castigated by Richard Kahlenberg of the Century Foundation, a leading advocate for economic integration of schools. Kahlenberg wrote in the Washington Post that "Dr. Weast's suggestion that pursuing economic school integration is not possible in the real world would surprise superintendents in almost 80 school districts nationally that use socioeconomic status as a factor in deciding where students attend school." But there are more than 13,000 superintendents across the nation, many of whom presumably would be less surprised at the challenges Weast highlighted. And many of today's economic-integration initiatives are modest in size or scope while the scale of educational failure for low-income youngsters is not  only about 10% of low-income students earn a college degree by age 24. Our schools remain relatively segregated places because American housing remains relatively segregated by income and race. (While the systemic shortchanging of minority students in public schools is increasingly getting attention, poor white students are systemically underserved as well, which points to yet another benefit of focusing on class rather than race.) Elementary schools are especially affected because they tend to draw students from small geographic areas. This has a variety of consequences, including putting good schools out of reach for many students. Erin Dillon of Education Sector, a policy think tank I co-founded, concluded in a 2008 analysis that even in the best-case scenario, only about 20% of students would be able to choose a better-performing school if various school-zoning boundaries were not an issue. In most cases, there simply were not enough good schools near concentrations of low-income students  and when there were open seats in those schools, competition for them was intense. Compounding this problem is the fact that large school districts like Montgomery County, which has more than 141,000 students, are not the norm. In 2008, only 281 school districts nationwide had more than 25,000 students; 9,698 had fewer than 2,500 students. We can't simply wish these boundaries away, and in many of these districts, the poverty is so widespread that the mathematics of economic integration don't work  there are not enough non-poor students. In addition to geographic realities, parents are not broadly supportive of ambitious transfer schemes or overly restrictive enrollment policies that constrain their choices. Specifically, parents who are paying the high property taxes that often accompany high-performing public schools are zealously protective of access to that amenity. Education analyst Rick Hess has likened their resistance to zoning changes to the way NFL season-ticket holders would react if their team suddenly announced that seating would be general admission. School administrators often reflect parents' reticence. In Massachusetts, where school districts can choose whether to accept transfer students from other districts, only about half do. In other states, there is even less appetite to move students around. In terms of what happens in the classroom, it's worth noting that more-affluent schools are not uniformly good schools, nor are they consistently effective at educating low-income students. The unprecedented transparency required by the No Child Left Behind Act has laid bare the stark inequities that exist within schools. Poor and minority youngsters often lag far behind overall averages  those gaps are a prime reason that even some relatively affluent schools are failing to meet the law's performance standards. Consequently, while the intangible benefits of more-diverse schools are obvious, the academic results from economic-integration initiatives are mixed. Students can be segregated within schools as well as from them. No one in the mainstream of the education debate wants segregated schools. But while such schools are not an immutable condition, they are an unfortunate fact of life. That's why so many in the reform community see issues such as improving teacher effectiveness, providing a better curriculum and expanding high-performing charter schools in underserved communities as more impactful and immediate steps than grand schemes to change housing policy or school-district boundaries. And of course, there are plenty of schools that demonstrate that high poverty rates and low achievement are not inexorably linked. These reformers, myself included, are not opposed to efforts to create more economically integrated schools. We're just keenly attuned to the practical constraints. The U.S. has spent decades trying different strategies to bring low-income students to good schools. Perhaps it's time to acknowledge the limitations of those approaches and double-down on the most promising efforts to bring good schools to students who need them  now. Watch a TIME video on Detroit's public schools.